Support 7V -9V Fast charging , great outlook and intelligent chip all in one design, bring you more safety driving experience. Highly-flexible ball-joint and adjustable two-section neck provide infinite viewing angles for a more relaxed and safer driving. The arms can adjustable, accommodate most phones including larger ones like the Phone X /8/8Plus or GPS navigations between 4-5.8inches. 1.As summer approaches and days are getting hotter, please avoid constant direct exposure to the sun as this may affect the function of your car mount. 2.Please clean the dashboard before using the car mount and clean the car mount and let it air dry if it is dirty. 3.The ideal installation inclination of the dashboard should be less than 15 degree. ☛10W Qi WIRELESS FAST CHARGER: The wireless car charger built-in large coils offers reliable 10W fast charging experience, up to 1.5 times faster than normal chargers. This wireless car phone mount charger, blends high-quality, great outlook and intelligent chip all in one design, engineered to safely enhance your driving experience. ☛ADJUSTABLE VIEWING & METAL RECOGNITION: The newly re-designed Telescopic Arm extends from 3.54"--5.81" and the ball joint rotates 360°for optimal viewing angles. The rotary axis provides 270°Rotation to help you find the most suitable angle for safe driving. Meanwhile, it has a metal foreign recognition function, which can Intelligently identify not the mobile phone and stop charging. ☛UNIVERSAL COMPATABILITY: The wireless charger compatible with iPhone X, 8, 8 Plus, 7, & Plus, 6, 6S plus 5S, 5C, 5, 4S, 4, iPod touch. Besides, it also has Android charging interface ,can supply android cell phone charging. Like Samsung Galaxy S2, S3, S4, S5, S6, S6 edge Plus etc. Universally holds all phone and case combinations from 4.0" -5.8". 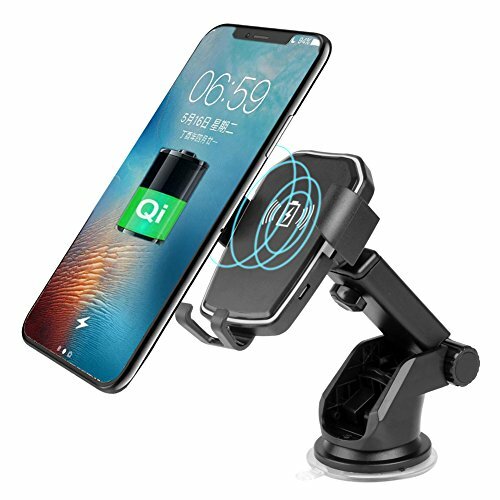 ☛DASHBOARD PAD & SUCTION CUP: Wireless charging car mount phone holder adopt secure suction pad sticks tightly on the dashboard or most surfaces and is easily removable. It can be restored by simply rinsing under warm water and air drying. At the same time, the holder telescopic arm and dragging adopt Soft Silicone Pad can Effectively protect your phone from scratches. ☛ONE-HANDED OPERATI: Easy one-handed operation with auto-clamping design - Automatically lock with gravity by slipping your phone onto mount, while it automatically releases by losing gravity after the phone is taken away. Enjoy the effortless viewing experience and wireless charging within one second, minimizing the danger of driving on journey. If you have any questions about this product by TUREAL, contact us by completing and submitting the form below. If you are looking for a specif part number, please include it with your message.